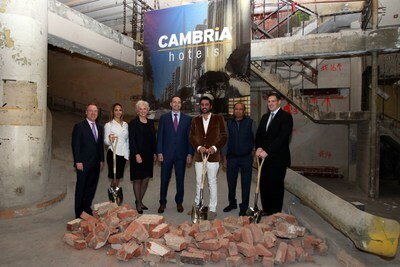 ROCKVILLE, Md., Jan. 28, 2019 /PRNewswire/ -- Choice Hotels International, Inc. (NYSE: CHH) is excited to announce that PNK Group Investments has begun construction on the Cambria Hotel Los Angeles – Spring Street in Downtown Los Angeles. Slated to open in 2020, the 13-story, 180-room hotel is the adaptive reuse of a Historic Core District building built in 1927 that was once the office for the Los Angeles Police Department Vice Squad. "Greater Los Angeles has always been a popular travel spot for U.S. and global travelers, and the Downtown area of this vibrant city is quickly becoming a top destination in its own right. The Los Angeles Convention Center attracts more than 2 million visitors annually and the city is exploding with new restaurants and shops catering to a diverse population," said Sagar Kumar, managing member of PNK Group Investments. "We cannot wait for guests to experience the one-of-a-kind transformed Cambria Hotel Los Angeles – Spring Street and all of the upscale amenities offered."